^ a b c Malenka RC, Nestler EJ, Hyman SE (2009). "Chapter 6: Widely Projecting Systems: Monoamines, Acetylcholine, and Orexin". In Sydor A, Brown RY (eds.). Molecular Neuropharmacology: A Foundation for Clinical Neuroscience (2nd ed.). New York: McGraw-Hill Medical. p. 155. ISBN 9780071481274. Different subregions of the VTA receive glutamatergic inputs from the prefrontal cortex, orexinergic inputs from the lateral hypothalamus, cholinergic and also glutamatergic and GABAergic inputs from the laterodorsal tegmental nucleus and pedunculopontine nucleus, noradrenergic inputs from the locus ceruleus, serotonergic inputs from the raphe nuclei, and GABAergic inputs from the nucleus accumbens and ventral pallidum. ^ Malenka RC, Nestler EJ, Hyman SE (2009). "Chapter 6: Widely Projecting Systems: Monoamines, Acetylcholine, and Orexin". In Sydor A, Brown RY (eds.). Molecular Neuropharmacology: A Foundation for Clinical Neuroscience (2nd ed.). New York: McGraw-Hill Medical. pp. 145, 156–157. ISBN 9780071481274. Descending NE fibers modulate afferent pain signals. ... The locus ceruleus (LC), which is located on the floor of the fourth ventricle in the rostral pons, contains more than 50% of all noradrenergic neurons in the brain; it innervates both the forebrain (eg, it provides virtually all the NE to the cerebral cortex) and regions of the brainstem and spinal cord. ... The other noradrenergic neurons in the brain occur in loose collections of cells in the brainstem, including the lateral tegmental regions. These neurons project largely within the brainstem and spinal cord. NE, along with 5HT, ACh, histamine, and orexin, is a critical regulator of the sleep-wake cycle and of levels of arousal. ... LC firing may also increase anxiety ...Stimulation of β-adrenergic receptors in the amygdala results in enhanced memory for stimuli encoded under strong negative emotion ... Epinephrine occurs in only a small number of central neurons, all located in the medulla. Epinephrine is involved in visceral functions, such as control of respiration. ^ a b c d e Malenka RC, Nestler EJ, Hyman SE (2009). "Chapter 12: Sleep and Arousal". In Sydor A, Brown RY (eds.). Molecular Neuropharmacology: A Foundation for Clinical Neuroscience (2nd ed.). New York, USA: McGraw-Hill Medical. p. 295. ISBN 9780071481274. The ARAS is a complex structure consisting of several different circuits including the four monoaminergic pathways ... 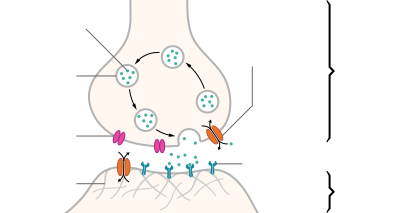 The norepinephrine pathway originates from the locus ceruleus (LC) and related brainstem nuclei; the serotonergic neurons originate from the raphe nuclei within the brainstem as well; the dopaminergic neurons originate in ventral tegmental area (VTA); and the histaminergic pathway originates from neurons in the tuberomammillary nucleus (TMN) of the posterior hypothalamus. As discussed in Chapter 6, these neurons project widely throughout the brain from restricted collections of cell bodies. Norepinephrine, serotonin, dopamine, and histamine have complex modulatory functions and, in general, promote wakefulness. The PT in the brain stem is also an important component of the ARAS. Activity of PT cholinergic neurons (REM-on cells) promotes REM sleep. During waking, REM-on cells are inhibited by a subset of ARAS norepinephrine and serotonin neurons called REM-off cells. ^ Malenka RC, Nestler EJ, Hyman SE (2009). "Chapter 6: Widely Projecting Systems: Monoamines, Acetylcholine, and Orexin". In Sydor A, Brown RY (eds.). Molecular Neuropharmacology: A Foundation for Clinical Neuroscience (2nd ed.). New York: McGraw-Hill Medical. pp. 175–176. ISBN 9780071481274. Within the brain, histamine is synthesized exclusively by neurons with their cell bodies in the tuberomammillary nucleus (TMN) that lies within the posterior hypothalamus. There are approximately 64000 histaminergic neurons per side in humans. These cells project throughout the brain and spinal cord. Areas that receive especially dense projections include the cerebral cortex, hippocampus, neostriatum, nucleus accumbens, amygdala, and hypothalamus. ... While the best characterized function of the histamine system in the brain is regulation of sleep and arousal, histamine is also involved in learning and memory ...It also appears that histamine is involved in the regulation of feeding and energy balance. ^ Malenka RC, Nestler EJ, Hyman SE (2009). "Chapter 6: Widely Projecting Systems: Monoamines, Acetylcholine, and Orexin". In Sydor A, Brown RY (eds.). Molecular Neuropharmacology: A Foundation for Clinical Neuroscience (2nd ed.). New York: McGraw-Hill Medical. pp. 158–160. ISBN 9780071481274. [The] dorsal raphe preferentially innervates the cerebral cortex, thalamus, striatal regions (caudate-putamen and nucleus accumbens), and dopaminergic nuclei of the midbrain (eg, the substantia nigra and ventral tegmental area), while the median raphe innervates the hippocampus, septum, and other structures of the limbic forebrain. ... it is clear that 5HT influences sleep, arousal, attention, processing of sensory information in the cerebral cortex, and important aspects of emotion (likely including aggression) and mood regulation. ...The rostral nuclei, which include the nucleus linearis, dorsal raphe, medial raphe, and raphe pontis, innervate most of the brain, including the cerebellum. The caudal nuclei, which comprise the raphe magnus, raphe pallidus, and raphe obscuris, have more limited projections that terminate in the cerebellum, brainstem, and spinal cord. ^ Malenka RC, Nestler EJ, Hyman SE (2009). "Chapter 6: Widely Projecting Systems: Monoamines, Acetylcholine, and Orexin". In Sydor A, Brown RY (eds.). Molecular Neuropharmacology: A Foundation for Clinical Neuroscience (2nd ed.). New York: McGraw-Hill Medical. pp. 167–175. ISBN 9780071481274. The basal forebrain cholinergic nuclei are comprised the medial septal nucleus (Ch1), the vertical nucleus of the diagonal band (Ch2), the horizontal limb of the diagonal band (Ch3), and the nucleus basalis of Meynert (Ch4). Brainstem cholinergic nuclei include the pedunculopontine nucleus (Ch5), the laterodorsal tegmental nucleus (Ch6), the medial habenula (Ch7), and the parabigeminal nucleus (Ch8).